Honesty, loyalty, piety, generosity, faith -- there is a long list of virtues that parents and teachers long to inculcate in their children. Textbooks cannot do it. Preaching often fails. Example is hard to find. Stories are often the best tool. What can be more enjoyable than a good story, and what can be more effective than such a story with a moral subtly woven within it? In this new, beautifully illustrated collection, Blitz tells many stories with a message. Some are familiar. Some are original. All are adapted for a childâ€™s interest. 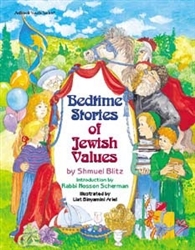 The reader may note that many of the stories originate in Talmudic and Midrashic literature. Others are familiar from generations ago. Here they are crafted to grab a childâ€™s wide-eyed attention and keep him or her asking to hear them and feast on their illustrations again and again. The sturdy, child-resistant binding guarantees many days and nights of enjoyable, beneficial use. Put this book with your childâ€™s favorites, and watch the virtues flow.